Day 93. 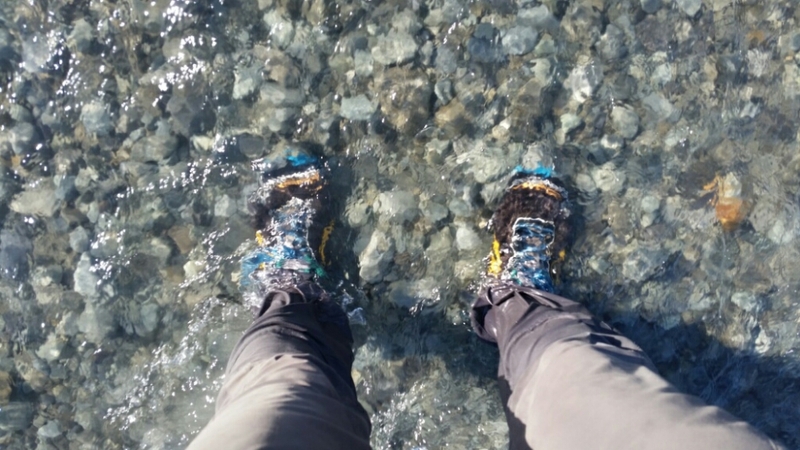 I crossed the Rangitata River! February 3, 2016. 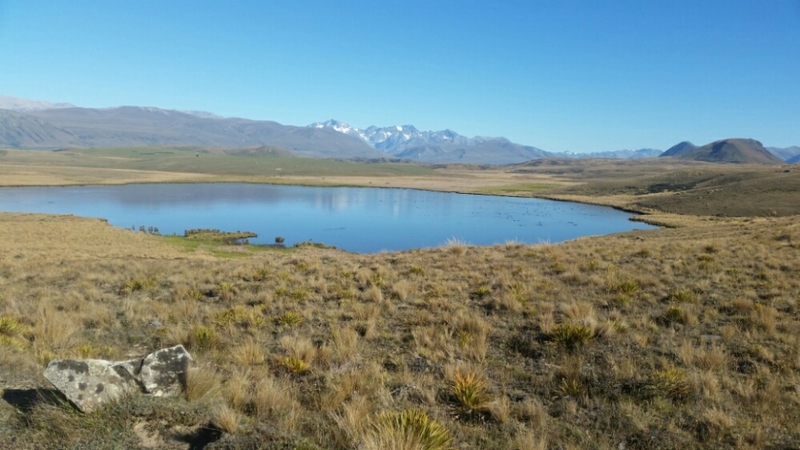 Today wad mostly easy, fairly flat with stunning views of the Two Thumb Range and the snow capped Southern Alps. If I would have hiked a bit farther yesterday I could have camped here at Lake Emily…. 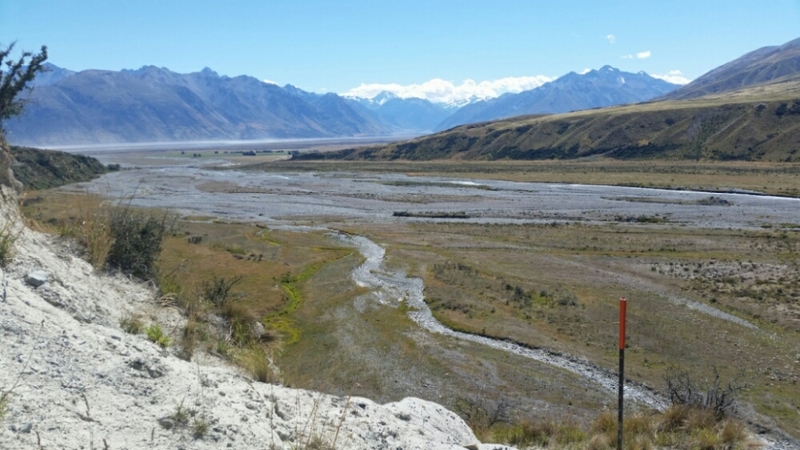 The Rangitata River is another Hazard Zone on the official trail. 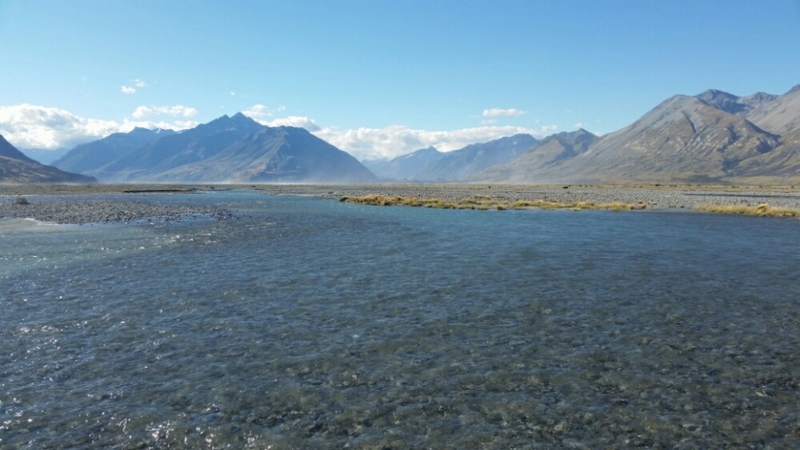 It is a braided river with multiple streams over 6 km across. It drains a huge area and can rise fast if it rains anywhere it drains. For that reason it is recommended that you hitch around. But it is about 200 km around and there isn’t much traffic especially on the south side. When I left Methven I had planned to hitch around. But I brought enough food in case I got easy hitches and didn’t end up going to a town with a store. The guys I have been hiking with planned to ford if it was possible. The 2 nobos who stopped in Comyns Hut for dinner said the river never got above their knees. Peter who was also at Comyns arranged for a $60 shuttle around but that’s not for 2 more days. 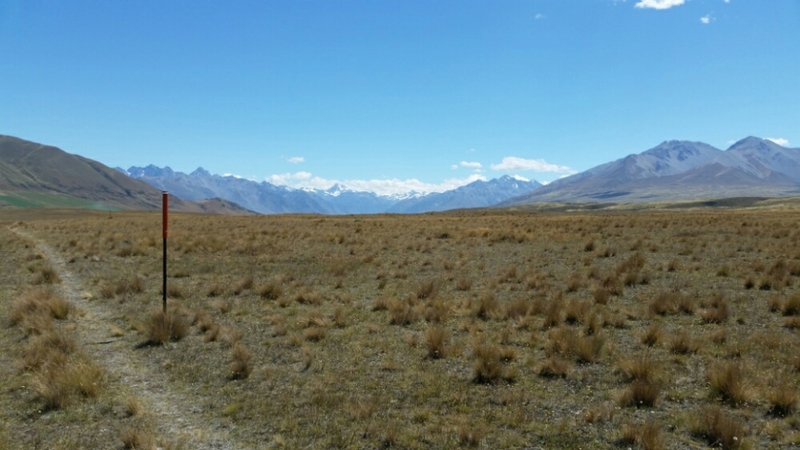 Yesterday I crossed paths with Janet, a 59 year old Kiwi from the North Island. She had just crossed and said she didn’t get her shorts wet. She showed me on the map where she crossed… at the 500 meter mark. Today a truck with DOC employees passed me on a 4 wheel drive road. They stopped to talk. 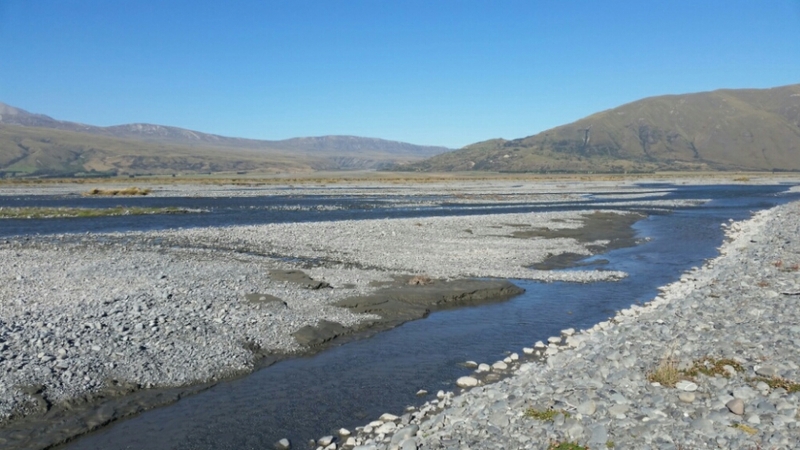 The subject of the Rangitata came up. Of course they had to recommend that I not attempt to cross. One of them said they only cross if the flow is below 80. And then you still have to walk up or down 1 km at each channel to find the best spot. I asked about the 500 meter mark. They don’t go by that. I got to the car park at 4:15. Decision time. I didn’t want to camp here. I decided I would try to hitch. A camper van drove by and didn’t even look at me. A car driving the other direction stopped. A local. He said the flow was 75. It takes 2 hours if you know what you are doing. I think Janet said it took her 3 hours. I decided to go see and turn back if it looked unsafe. I decided to use Janet’s 500 meter guide. It made the crossing way longer because I got higher up than even 500. But it was pretty easy to find places to cross that were below my knees. And then 3 meters from finishing all the crossings I slipped and did a belly flop in 6 inches of water. I guess I let my guard down a bit too early. I just had to laugh. .... and it's not very deep here. I found the cobble road and walked that to the car park and start of the Two Thumb Track. 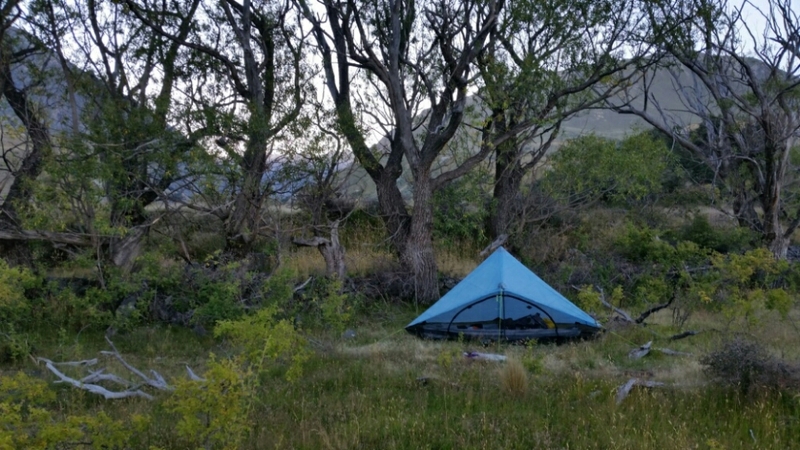 I walked in about 1 km until I found a place to camp. It’s perfect. There is a slight breeze. I think I will sleep well tonight. You deserved to sleep well. Congratulations on the safe crossing! Good on ya! And thanks for telling us after you made it across successfully. Would have loved to have seen that belly flop. LOL I’m sure you feel like me that these challenges would feel a bit less risky with a partner around but oh well . 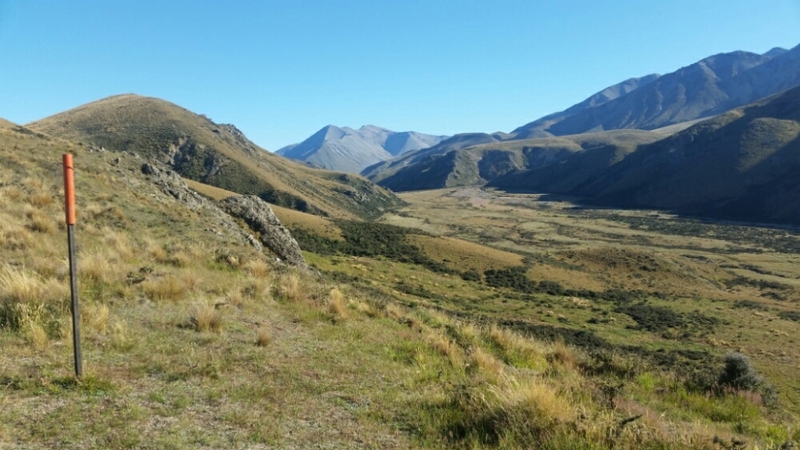 . .
Is hiking with someone else really more safe? I think it just makes us feel safer. No safer but they can witness us drowning . . therefore no mystery about our disappearance. Yikes 2 hours for a river crossing? I am so glad you made it safe.